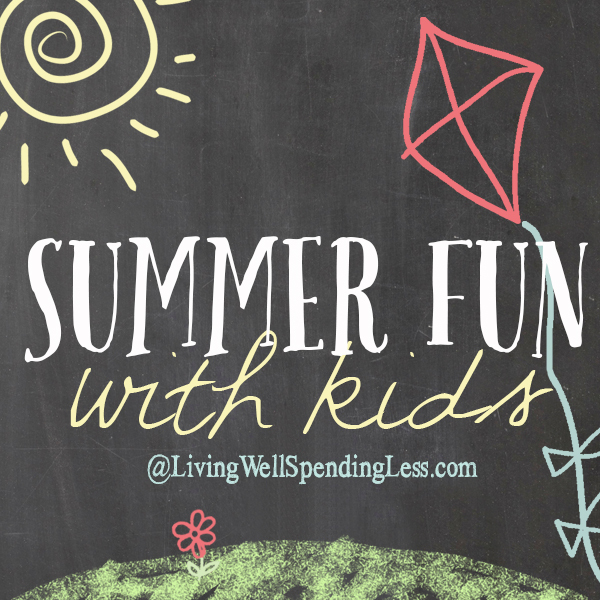 This is Week 11 of our 12-week Summer Fun with Kids series here at LWSL! 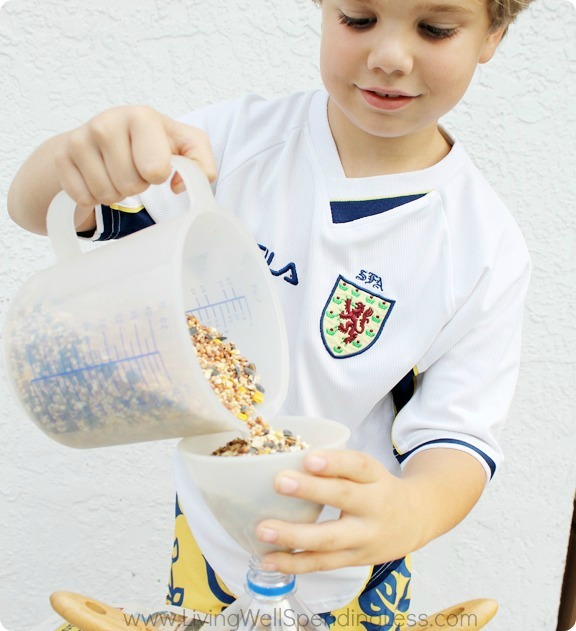 Today we are welcoming Claire from A Little CLAIREification, who is sharing her super cute and easy DIY Bird Feeder . For more summer fun, check out the overview page. How’s your Summer been going, my LWSL friends? It’s me, Claire from A Little CLAIREification, and I just cannot believe my boys start back to school next week! 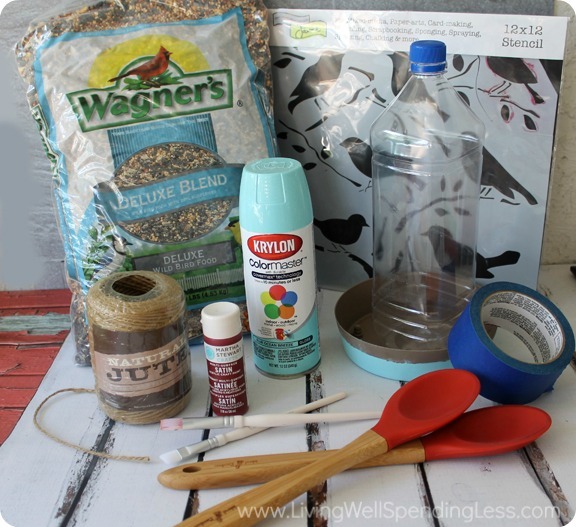 We have tried to pack in as much fun as possible over the break and, earlier this Summer, my Littlest and I decided to make a little DIY Bird Feeder. We have a sweet pair of cardinals that live in the bushes just outside of our screened in pool patio and it’s so much fun watching them flit around – we love how they talk back and forth to each other. You can also pop over to my blog for more fun crafts like these DIY Glittery Glow Jars and I hope you’ll say hello while you’re there!! Here’s how we did it on the cheap mostly using items we already had on hand. Step 1: To start, we taped off the lip of the plant tray since we didn’t want little bird feet getting paint on them. Could be toxic! You’ll see that several steps here are optional like this one but I thought it would be fun to have the feeder be aqua so once the lip was taped off we spray painted it and let it dry for a couple of hours. 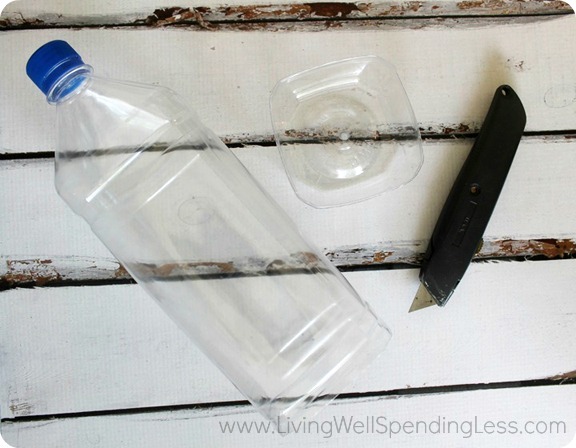 Step 2: While that was drying, I used a craft knife to cut a couple of inches off the bottom of the water bottle – this is definitely a step that adults should do. I used scissors to even out any rough spots and make it sit level. Step 3: Next we used a Sharpie to make a half circles / arches on each side of the bottom of the bottle and then we used scissors to cut out. This is so the bird seed can flow out into the tray. 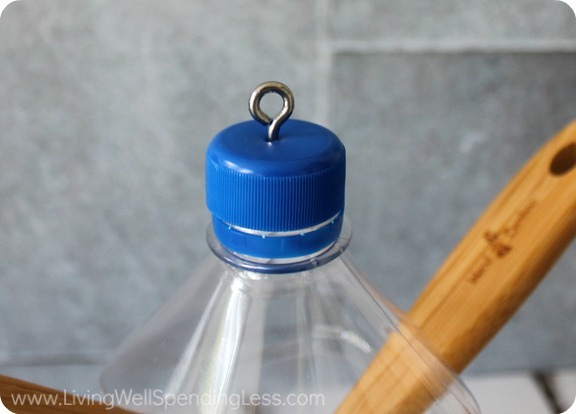 If using a round water bottle, just evenly space out 2-3 little arches. Step 4: We love our little bird stencils we found on Amazon but you could use whichever pattern you like. We cut out the one we wanted to use and taped it on the bottle to secure it, and then my Littlest painted it. Now, I added the spatulas and I am going to tell you this right now. I wouldn’t bother if we did it again. I thought it would give a a little landing spot for the birds and envisioned the bird seed flowing out onto them. This was not the reality. Step 5: I basically cut a small hole and a larger hole on two opposite sides so the handle could go through and out the other side. They look kind of cute, I know, but it really was an unnecessary step. In the end, I had to use clear packing tape to cover the holes so I feel like you should learn from this trial and error. The cardinals told us they didn’t care, by the way. 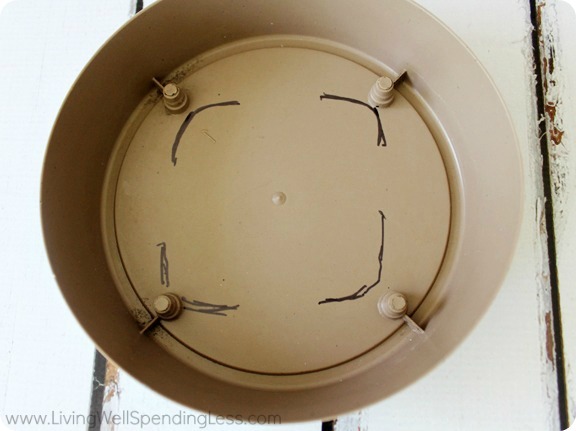 Step 6: We screwed a little eye hook into the cap for hanging. I actually added a little hot glue inside the cap for extra support because… well, “it’s for the birds” right? Step 7: Next we placed the water bottle inside the tray and traced around with a Sharpie so I could place the hot glue in the right spot. I actually used both hot glue AND a little Gorilla Glue because… I did not want this to fall apart once it was hung, especially if a random squirrel decided to jump on board for lunch! 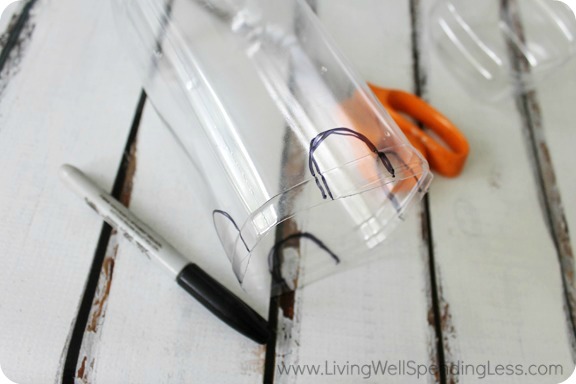 Step 8: Glue the water bottle into the planter and allow to dry for several hours. Next, funnel your bird seed into the finished Bird Feeder and hang using the twine. While it might take a few days, be prepared for your fabulous little feathered friends to notice. I sooo wish I could have gotten a closer pic but those smart cardinals were hip to my jive (not to mention my children are loud). 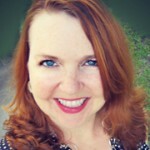 Claire is a working Mama to three boys, a self-proclaimed cheese addict and a lover of all things crafty and delicious. Her blog, A Little CLAIREification, is a lifestyle blog committed to bringing readers “Bright Ideas On A Budget” – from cooking, baking, crafting and DIY projects to time management tips, meal planning and inspiration. What kind of wildlife visits your backyard? We love watching birds! 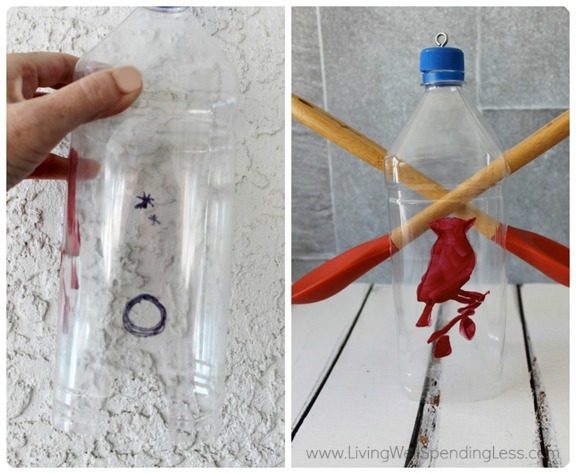 Could you create an easy DIY hummingbird feeder, too? 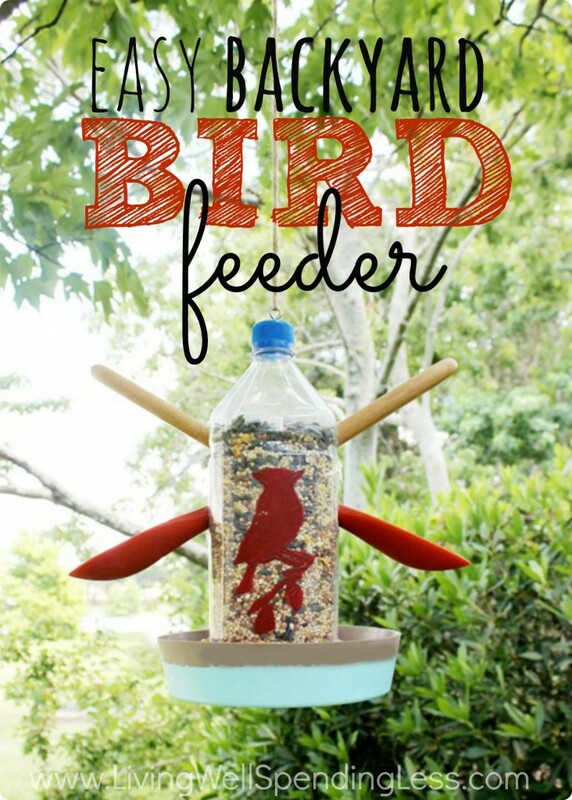 What a fun craft to do with the kids and how rewarding for them when they see the birds coming to feed. We don’t really have a backyard to our town house. We get the occasional wood pecker in the tree behind our unit though! And a lizard got into my kitchen once. I love love love your posts. Thank you so much for all the fun ideas that are cheap! My kids love them and I’m incorporating some of them to do at our Girl Scout meetings that I am a leader of. And as for wildlife that visits our backyard- stray cats. Can you figure out a device to keep those away? They are mean little suckers! We have squirrels, birds and also cats and dogs lol. We live in town but have a woodsy area behind our apartment. These are so cute! 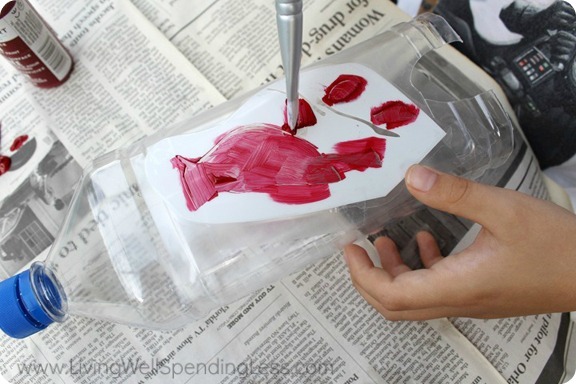 It’s a great way to get kids attuned to nature! We currently have two baby bunnies living in our backyard. Lots of birds, too! Squirrels, frogs, horses, goats, dogs, cats. We get some birds and a few squirrels in our yard, but we live near a very busy street so that doesn’t surprise me that we don’t see more. Love love love this idea! Our breakfast table is the perfect spot for viewing birds! Great recycling project! We all of birds, rabbits, moles, voles, groundhogs, even the occasional fox in our yard. This is great. I am teaching about birds this fall with 10 home school students and plan to do this! Thanks for sharing! Birds, bunnies, deer, and a couple of red foxes! We have had a lot of hummingbirds – last year they built a nest and we had 3 baby birds. It was great!! We also get annoying deer eating our garden!! We live in the country and get lots of deer, rabbits, & squirrels. We also see our share of raccoons. It drives my little dog nuts when he’s inside watching them through the windows LOL. I live in an apartment building, but we have bird feeders outside and we live on the back side of the building so it’s quiet. We get bunnies, chipmunks and squirrels visiting us 🙂 And even a big King Snake was visiting a few weeks ago. That was a site! But lots of birds, too. Hummingbirds and even wood peckers! we have a lot of deer out where I live! I see them pretty much daily! Here in Arizona it is mostly birds, little lizards and ugh scorpions ! We do occationally see a roadrunner though – they are super cute ! We get a lot of wild turkeys. Once I had a duck hang out all day. Squirrels, rabbits, & various birds visit my backyard. We have a rather large vegetable garden and we have seen many rabbits, deer, and squirrels in our backyard. It’s really funny to see half eaten ears of corn left around. Especially when I’m not growing any corn! We have humming birds, doves, grackles, robins, and 2 hawks along with lizards that seem to enjoy my backyard each year. Once had a roadrunner! This is a really great idea!! And so cool!! We get a lot of birds, squirrels and raccoons!! We live in town so we get to see squirrels, rabbits, birds of all sorts as well as the occasional deer family. We have alot of blue jays that visit! We have a baby bunny, hummingbirds, lots of sparrows, tufted titmouse and a few other birds in our yard. I love to feed the animals. This project was adorable. We live in a subdivision but we have the whole forrest behind us so we see a lot of widlife that visit our yard and even eat our bushes and dig in our ground like deers, armadillo, racoon, squirrels, fox, snakes, and different birds like cardinals, chickadee, woodpeckers, owls, hummingbirds and others that i haven’t identified. We have quite a collection since we have a creek down the hilly forest. We live in an apartment and we have a cardinal that visits us a lot. My kids love seeing him. They can even recognize his song and know to look for him when they hear him. I think this is brilliant!! And I appreciate you sharing your experience, even the steps you wouldn’t do the second time :). I love all the birds that come to my feeders. Here in Florida we enjoy the painted buntings & indigo buntings from October thru April. We have Cardinals year round. Unfortunately we are in the city with a small yard. So far we have only seen butterflies, squirrels and a few birds. Hopefully this will bring some more birds to our yard. So cute! We love all of the birds that come into our yard, especially in the spring. Cardinals have always been my favorite though! We all love to watch the birds. How much more fun if the kids have made the feeders themselves. Great idea. Thanks for the giveaway! What a fun and easy idea! 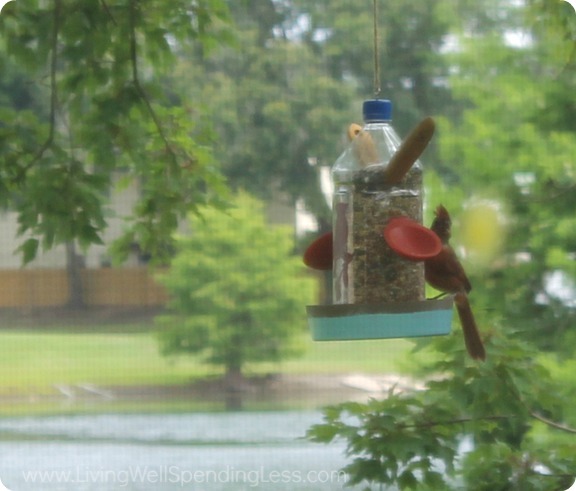 Love the bird feeder, easy to make. Thank you.